Our team prides itself on successfully materialising and enhancing clients’ identities. 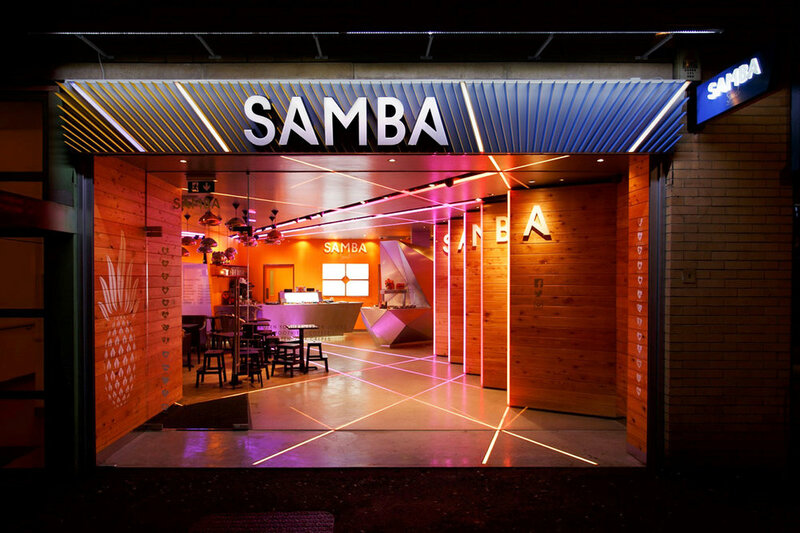 When we were approached by frozen yogurt chain Samba Swirl to completely refresh its identity our first instinct was to capture the energy of the brand through carefully selected materials and lighting. Our top priority was to steer clear of existing soft, slow and white frozen yoghurt design clichés, creating something unexpectedly dynamic and angular to set the brand apart. Inspired by our client’s brand name, we created a futuristic, carnival spirit for the high street, informed by the geometry and colours of Rio De Janeiro’s favelas. 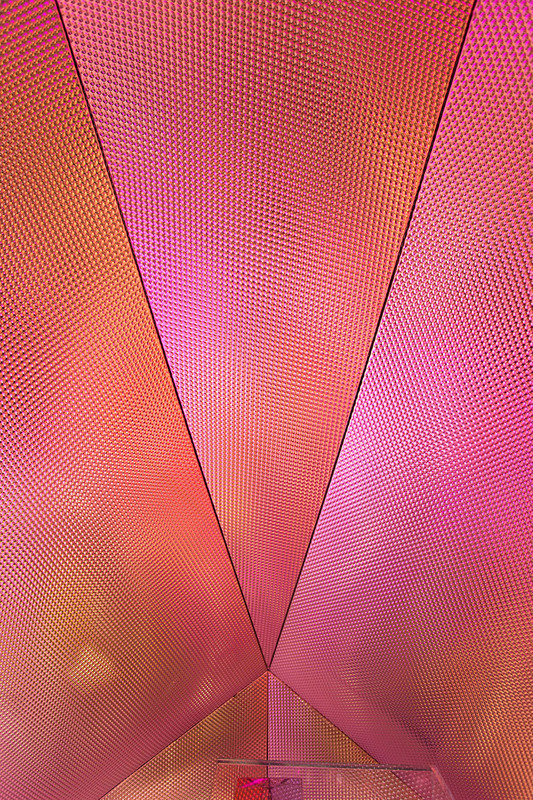 These visual cues were re-imagined using LED light emanating from every plane of the store. 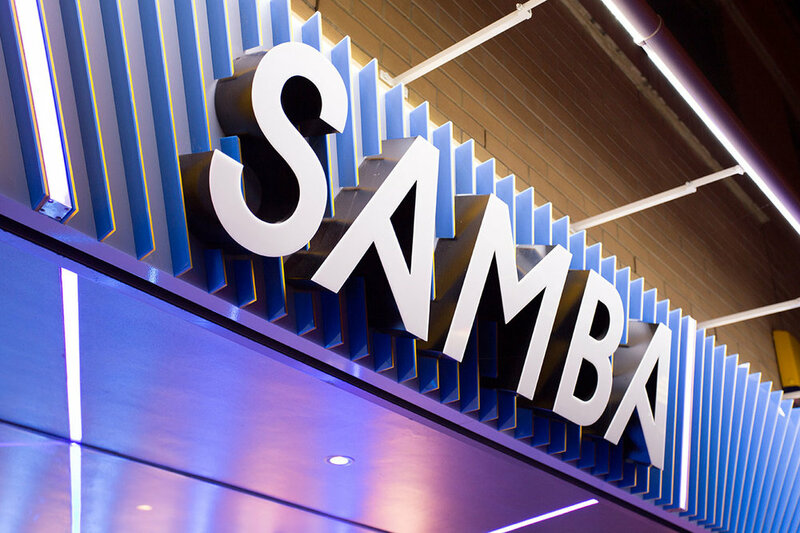 Samba Swirl established the first self-service yoghurt chain in the UK back in April 2011. Their name has since come to embody the experience and passion they have for fun, health, energy and great taste. 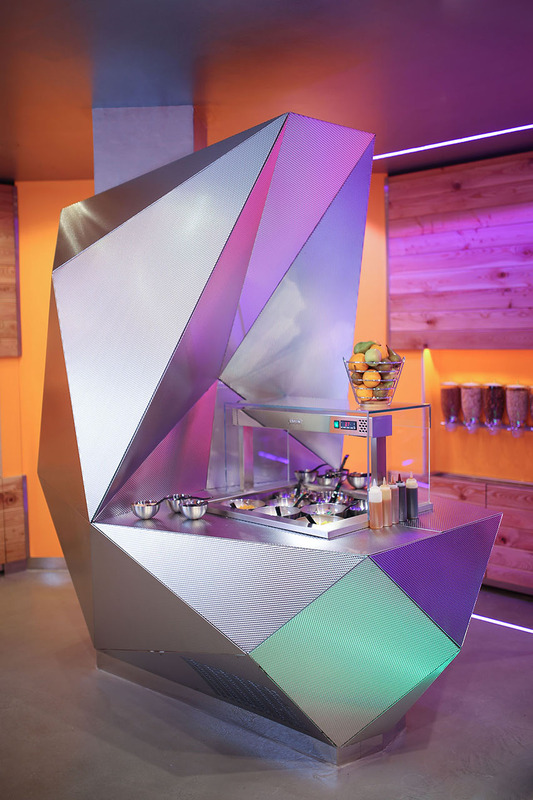 We translated their vibrant attitude towards food and social interaction into exciting and engaging, razor-sharp interiors – catapulting their image into the future with digitally-aided design. The design journey started with pulsating LED light emanating from the store’s walls, floors, ceilings, out and lipping up on to the front fascia. The LED primarily functions as a way-finder system that pulls visitors in form the street and directs them around the store – leading them on a colourful, animated, frozen yoghurt voyage from entrance to self service yogurt machines, then to the counter and seating. The criss-crossing LED lighting maps out one of the key feature design elements of the store – the series of timber clad frozen yoghurt cubicles set upon a dark, trowelled micro-concrete floor which is reminiscent of the shacks found in the favelas and streets Rio De Janeiro.